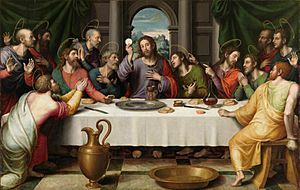 The term Communion comes from Latin communio (sharing in common). The corresponding term in Greek is κοινωνία, which is often translated as "fellowship". In Christianity, the basic meaning of the term communion is an especially close relationship of Christians, as individuals or as a Church, with God and with other Christians. But the term is also used of a group of Christian Churches that have this close relationship of communion with each other. An example is the Anglican Communion. If the relationship between the Churches is complete, involving fulness of "those bonds of communion - faith, sacraments and pastoral governance - that permit the Faithful to receive the life of grace within the Church", it is called full communion. But the term "full communion" is often used as well in that sense that these Christian Churches are not united, but have only an arrangement where members of each Church have certain rights within the other. If a Church recognizes that another Church, with which it lacks bonds of pastoral governance, shares with it some of the beliefs and essential practices of Christianity, it may speak of "partial communion" between it and the other Church. The communion of saints is the relationship that, according to the belief of Christians, exists between them as people made holy by their link with Christ. This relationship is generally understood to mean not only those still in earthly life, but also to those who have gone past death to be "at home with the Lord" (2 Corinthians 5:8). In a special way the term communion is applied to sharing in the Eucharist. In the Bible, the Greek term κοινωνία is only used in the New Testament. It does not appear at all in the ancient Greek translation of the Old Testament known as the Septuagint. As a noun, or in its adjectival or verbal forms, it is found in 43 verses of the New Testament. In addition, the noun is found in some manuscripts (used for producing the English translation known as the King James Version, but not for more recent translations) in Ephesians 3:9. Communion (Christian) Facts for Kids. Kiddle Encyclopedia.